Leds don't use much power so depending on the led you can run quite a few. It all depends on what type leds you use. where can I get this ATC Fuse Holder? Click the big red "Add to Cart" button on the product page. You can't miss it! Best to always run an line fuse from the battery, other power sources have fuses so not necessary. A smaller fuse would be better, 2-3 amp. I have 5 12v led strips and 5 on/off toggle switches i want to wire them too. I read different posts saying i need a fuse and others saying i can hook the positive wire straight to the battery, does that work just to hook it to the battery without fuses? A fuse isn't required for the lights to work. You can still hook them up directly to the battery. But most people still want to use a fuse to protect the circuit and wiring in case of a short. As a similar example, you don't need to wear a seatbelt in order to drive a car. It doesn't do much good when everything is running smoothly. But if there's a crash, it is quite useful. Should I go from the fuse box or straight from the battery..
2 or 4 amp fuse will be fine. You can go from with the battery or the fuse box. Depends on how much power is pulled from each product. An 8 Amp dimmable driver. Im planning to install 6 led strips(purple) in my car. 15 leds per strip. So what amp fuse should i use? And what type of wire should i use? It depends on the strip. Each length and color will pull something different. Check out our tech page on the product you want for how much they pull. can you have to big of a fuse? I have 5 12v led strips under my truck, 2 5ft stripes,2 1ft strips, and 1 2ft strip all wired together, each strip has its own ground. with 16 guage positive and ground wire. (couldnt get 18guage) I had it connected to a 10 amp fuse inside but blew. then I connected it to a different 10amp fuse and It instantly melted the switch. so now I want to wire it directly to the battery with a in-line fuse and wondering what size fuse should i get with 16 guage? A 3 amp would be sufficient. Hello I'm running 6 12" LED light stripes to a LED switch in my dash and putting a 6 poll fuze box on the firewall so I'm running the wire from the battery to the box and need to no what size fuze I should've running I have a 15amp in it now but haven't tryed it yet by reading the posts I think I'm to high with the 15amp ? Any help would be helpful. 15 amps is way to high. It depends on how many mA your strips are pulling. Check the tech page of the strips you ordered. does each cathode have to have a fuse on it? if so where do i install it? You're welcome to use a single fuse, and install it between your power source, and the cathode transformer. I am installing led washer nozzles with a switch. The wire is 26awg so what fuse holder and fuse size should I get to install in between the battery and switch? Depends on how much the washer nozzle pulls. Contact the manufacture. We don't see those. I have 7 12v led strips connected to my bike. Each strip has 24 LED's. I just want to control them with a normal switch. First, what exactly is the purpose of adding a fuse holder instead of just wiring them directly from the battery to the switch? Also, what fuse should I use and what gauge wires should I use for it? This is what happens if you don't use a fuse. The fuse size depends on how much each strip pulls. Each strip and color pulls a different amount. Any gauge from 16-22 gauge will be fine. Yes. Use a 2-3 amp at most. It depends on the mA that each strip pulls. I wanted to add puddle lights under my car. I would use led strips. I dont know anything about this but obviously from the video one would go to the battery but where does the other one go to? And does it matter what gauge wire to use? and if you use this would it be possible to hook it up to the car so the lights would turn on when you open and unlock the door? One wire goes to the battery or power source, the other wire is the ground, to be attached to metal somewhere near the power source. Wire should be 14 to 18 gauge. You could the Adjustable Door Pin Switch [https://www.oznium.com/pin-switch], or hook it into the same circuit as the door lights or dome light. I want to wire up 10, RGB Led strips in parallel. Each strip has 6 leds and each strips draw would be 120mA. The controller is 108W output, 3 amps per channel (9 Total). Its working off a 12 volt motorcycle battery. What size inline fuse should I use? Also I have a 7.5A fuse in now, and 20 gauge wire connecting everything in parallel will this work fine? 120 mA x 10 strips=1200 mA or 1.2 amps. A 2 amp fuse would be enough, most of our wire is 14 to 18 gauge, 20 ga should work. The size fuse depends on how many lights you are using. If using RGB strips, you could use the 4 Channel Remote to control them. Sorry, not sure what you are trying to do here. I want to run x4 1 Foot LED's and i want to use the 3 foot extensions to daisy chain everything together I'm using 5 extension cables all together. Would that be possible? If so what gauge wire would i use and what fuse? I also would like to hook them up to the battery since its in the trunk next to the first LED. Yes, you can daisy chain them together. 18 gauge wire works fine, we also sell this [https://www.oznium.com/wire-12v-and-relays/hookup-wire]. The fuse size depends on what lights and how many you are using. I'm looking to put some LED Strips in my Wheel wells. What is your suggestion for doing so. What size strips should i get. I want to wire this to a switch in my car so what kind of fuse would I need. What would be the best/recommended source of power? The size of each vehicle wheel well will vary. Measure the inside of the well to see how much space you have. The fuse size is determined by how long the strip(s) is/are. You can use any standard 18 gauge wire for the power source. Any fuse from 1 to 5 amps is fine. The current draw is about 100 mA per foot. That equals .1amps per foot. Depending one the number of feet, makes the fuse size. Not if you wire it to the non power side of the fuse. Please use a test light and make sure the side you connect the wire to does not have power to it when the wire is attached if the fuse is not in. 5 amp would be to much. Look for a 2-3 amp fuse. The difference is convenience and placement. A set of cathodes draws .7 amps. Therefore 2 sets would draw 1.4 amps. Please use a fuse accordingly. Yes, you can connect 2 cathode kits to 1 fuse. A 3 amp fuse will work great. You connect the fuse holder to the positive of the battery. The negative/ground of the lights usually is connected to the negative/ground of the battery, or metal part of the car. I have 2 weatherproof LED ribbons, one 1ft. the other 2 ft. Do I connect it in a series or parallel and do i need to connect a fuse to it? If you are connecting directly from your car battery you will need a in-line fuse holder and fuse. you need not worry about a fuse, your cigarette lighter is already stock fused. Always connect in parallel, all positives and negatives wired together to the power source. Hey, I'm putting 4 Extremely bright pre-wired superflux 4-chip LED's in my vents and was wondering what fuse holder and type of fuse to put it in to make it work. I will be splicing into my Cigarette Lighter since i dont use the thing. Considering the cig lighter in your car is already fused, I wouldn't even bother adding a second fuse. You'll probably need at least a few feet of wire for the install. I don't think the Fuse Holder has much to do with whether the fuse will blow out or not. If you put a 5 amp fuse in the fuse holder and your electrical current is greater that 5 amps the fuse will blow. The Fuse Holder is exactly that, it just holds the fuse. one end of the adaptor goes to the battery and what does the other end connect to? The other end connects to the positive wires on whatever you are connecing to it. You will need at least a 5 to 7.5 amp fuse. It comes with about 3 inches on either side of the fuse holder. That will be fine. A higher amp fuse will not blow out your LEDs. Solder the two wires together and then protect it with heat shrink tubing. Maybe some electrical tape after that if you wanna be really professional about it. Considering each cathode kit draws .7 amps, and you have 5 cathode kits, that is 3.5 amps of current from the cathode kits. You must increase the fuse size to 5 amps. A 3 amp fuse would be sufficient. Each cathode transformer draws approx. 0.7 amps, and LEDs draw very very little current. would that require 10 or 16 gauge and what fuse should i use? 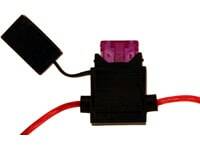 How about using a 5 amp fuse, and either the 10 or 16 gauge fuse holder will work fine. I wanna run about 6-8 LEDs - will the 16 gauge wire be able to handle it? And what amp fuse should I use? 16 will handle just fine (actually a smaller gauge such as 20 is even more ideal), and a 3 amp fuse is fine.